Apprenticeships are a productive and cost effective way to grow your business. But how do Apprenticeships work, what are the benefits and risks and how do employers get involved? All you need to know about Apprenticeships was the theme for the third webinar in our free Learning Bites series which took place on 30 August 2018. The webinar gave the low down on the Government scheme including advice on how HR professionals can grow Apprenticeships in their organisation. Here is the Q&A from the session. Click here to listen to the full recording. What is the Government’s Apprenticeship Scheme all about? It is Government policy to significantly increase the number of Apprenticeships going through the system to three million starters by summer 2020. All political parties are committed to this and significant public funding is being invested in the scheme. Employers with a salary bill of over £3 million are paying a 0.5% levy to help fund the new Apprenticeships. Organisations can recover this levy through the delivery of Apprenticeship training. The levy was introduced in 2017 and is still new. It has taken time to bed down and there have been some teething problems but the tide is turning and big business is now much more on board. There are major differences to Apprenticeship funding for small and medium size companies. If your salary bill is less than £3 million, then your organisation could have 90% of its Apprenticeship costs paid. There is a 10% compulsory contribution to training costs. Smaller businesses with fewer than 50 staff, will have 100% of the Apprenticeship costs covered. SMEs too are taking advantage of the Apprenticeship offer. Why are more Apprenticeships needed? It has been well reported that the UK is falling behind its competitors in terms of skills and productivity and the Government believes the Apprenticeship scheme will help to address these issues. But it’s not just about upskilling the workforce. With tuition fees being at an all- time high, more young people and their parents are considering carefully if university is the best route into a career. Organisations have realised this and if they don’t want to lose the best and the brightest who don’t want to go to university, they need to look at other ways to attract young people to their companies. As more school leavers look for alternatives to university, it is the companies that invest in Apprenticeships now that will reap the benefits in the future. Why should HR professionals be interested in the scheme? HR professionals should be interested because it provides a great opportunity not only to bring in new talent but also to train their existing teams, as current staff may also be eligible for Apprenticeships. Now is the time for HRs to address some of their talent challenges and skills gaps by accessing the pot of money which has been made available for Apprenticeships. What are the business benefits of running an Apprenticeship scheme? Organisations want to attract new talent to their businesses and to develop training programmes that will improve skills and ultimately boost productivity. The Government has made funding available to encourage Apprenticeship schemes so there is an incentive for companies to get involved, particularly if they have a salary bill of over £3 million and are already paying the 0.5% levy. If you are paying you might as well use it to help deliver the strategic objectives of your organisation. All the available data indicates that investing in Apprenticeships improves staff retention, loyalty and job satisfaction. Attracting new people also brings a whole new way of looking at things together with well-developed digital skills, something which all businesses need now. Apprenticeships really do create a win win situation for everyone! What are the advantages of Apprenticeship programmes for individuals? For people who would benefit from both gaining a qualification and a longer time spent on training and learning, then Apprenticeships can be very helpful. Apprenticeships are more than just a qualification. It is important to take into account all the other aspects of the programme, around behaviours, learning to be part of the organisation and developing individual learning skills. These are all very significant parts of the scheme. At the end of the training many individuals will come away with a qualification, they will have achieved an Apprenticeship which is graded and they will have membership of a professional institution which is an integral part of any Apprenticeship. Are Apprenticeships just for school leavers and young people? Definitely not. There are hundreds of Apprenticeships available for any business and people of all ages can apply. Almost every job role now has an Apprenticeship standard attached to it – that includes traditional roles such as hairdressing and roles which generally have been accessed through university such as a becoming a solicitor. The good news, which will be of interest to HRs, is that you can use the funding to upskill current staff, so, for example, an employee could gain a Master’s Degree in Management through the Apprenticeship route. However, not all Apprenticeships include mandatory qualifications. Apprenticeships are more about people having the level of investment in their skills to make them the best they can be in their roles at work. What do HRs need to know about Apprenticeships? The most important thing for HR professionals is to find a provider they can work in partnership with who can hold their hand throughout the whole process from start to finish. The Government hasn’t made the job easy. There are bureaucratic processes in place, jargon to wade through and lots of paperwork to complete. Apprenticeships can be lengthy programmes and by law they need to be at least a year long regardless of what the apprentice has completed prior to joining the programme. The length varies considerably depending on the sector. A solicitor’s Apprenticeship, for example, is for six or seven years. Other Apprenticeships can be between 15 and 18 months. Not everyone is suited to an Apprenticeship. HR professionals need to be clear about their current staff who would benefit, the job roles they are in and why they would be suited to this type of training. For new recruits, it is more about how and where an Apprenticeship would add value. While most employers won’t be paying for the training, there are associated employment and training costs to consider. It really is all about the individual. An individual who doesn’t require a lengthy training programme won’t need an Apprenticeship. Individuals who would benefit from more lengthy training and development are those who should be considered. HRs should also know that all Leadership and Management and HR CIPD qualifications can be delivered via the apprentice route. Watson Martin is currently working with a number of companies to help them deliver their HR Apprenticeship strategy. There are a variety of ways to deliver Apprenticeship programmes. Some will be via a day release programme, others will follow a more blended learning approach which could include both e-learning and classroom based delivery. There is no right way and a good provider will work with you to achieve the best delivery method for your organisation. Apprenticeships can be tailored to your company’s needs particularly if you have enough numbers; we would ask for a minimum of six for our HR programmes. The training provider can then focus on the policies, cultures and values of the organisation. In this way they are similar to the best graduate training programmes. How do businesses recruit Apprenticeships? You can recruit Apprenticeships in the same way you recruit other staff. It is an employer’s decision how they recruit and ultimately any apprentices appointed are employees just like any other staff members. The Government also runs a Find an Apprenticeship Service for employers who want to recruit an apprentice by posting their vacancy on the site. This service is also used by young people to search for an Apprenticeship and to submit their application. Training providers can also help with the recruitment process. Some employers have shown a reluctance to commit to an Apprenticeship scheme because they are worried they will have to treat their apprentices differently to other staff, particularly when it comes to performance management. This is not the case. Apprentices are treated like any other member of staff and if there are any disciplinary issues then they will be dealt with in the company’s usual way. Apprentices are supported by their employer via the on-the- job training they are given and the training provider will deliver some of the off-the-job training. Pastoral support and checking on progress is a partnership between both sides. There are guidelines about how both sides should support their apprentices for the duration of the training. Are Apprenticeships just for big business or can SMEs benefit? Apprenticeships are for any organisation. Historically there has been more take up among small businesses as it is a cost effective way of recruiting staff but now larger organisations are becoming more involved. For any sized business, Apprenticeships are a cost effective way of recruiting, training and retaining their employees. For example, in a small business the HR function can often be farmed out to an office manager as an add-on to their other duties. An Apprenticeship in HR in this instance would be a cost effective upskilling route. 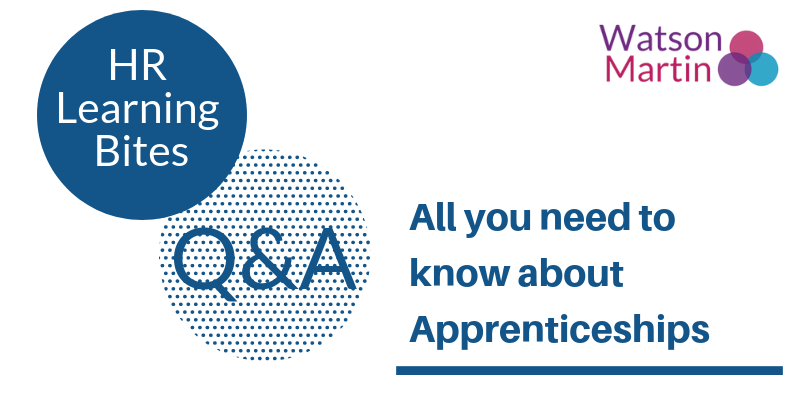 How can I ensure my organisation gets ROI with an Apprenticeship scheme? It’s like anything else – what you put in will help to determine what you get out, and the first thing is to ensure the job role is suitable for an Apprenticeship and there is support in the organisation for the training programme. As a great deal of the training is on the job, it is not right for every business. If everyone in the company is rushed off their feet then the last thing they should do is to take on an apprentice because then they simply become a drain on the business. Secondly it is important to ensure you get the right person for an Apprenticeship role as they are not for everyone. However, if the role is right for an Apprenticeship and the right person can be recruited, then hiring an apprentice is a productive and efficient way for any business to cost-effectively recruit and upskill their workforce. Are Apprenticeships the future for organisations? Yes we think they are here to stay. Not only are there long term funding commitments from all political parties to the programme, but the majority of organisations we speak to say their number one challenge is attracting and retaining the right talent to deliver their future strategy. With all the uncertainty of Brexit, Apprenticeships provide an ideal way to recruit and grow a talented, motivated and qualified workforce. We don’t think there will be any major shift in policy but there is no doubt that the bureaucracy around the scheme is putting some employers off so we might see changes to systems. Working with the right training provider though should remove the bureaucracy and make the process relatively pain free. There is also a debate going on about whether small business employers should continue to make the compulsory ten percent contribution to training costs when they didn’t have to pay this before but no decision has been reached on this yet. The site also has information on How Apprenticeship Funding Works including information on the Apprenticeship levy. Watson Martin is approved as a Main Provider on the Register of Apprenticeship Training Providers (RoATP) and is well placed to help business develop and implement a high-quality Apprenticeship strategy in HR and Leadership and Management. Further information on how we can help deliver your Apprenticeship programme or work in partnership with other training providers, please call Sharon White on 020 7932 2760 for further details. Get a Year’s Free CIPD Student Membership on Us! First Time in a Management Role?